A rest from right back duties for David Perkins? It is now sixteen months since Emmerson Boyce left Wigan Athletic under acrimonious circumstances. Boyce had been at the heart of most of the club’s greatest achievements and was much loved by the fans. It was never going to be an easy parting of ways. When news broke out about Boyce’s departure in May 2015 there was consternation among his supporters, many of whom felt the club could have done more to keep him. There were myriad arguments for and against the club in the Boyce debate. But although the issues revolved largely around loyalty towards a player who had become a club legend, there were also those who questioned whether Latics could get a player who was any better to replace him. Boyce was signed by Paul Jewell in August 2006. He went on to stay for nine seasons, his versatility in being able to play in the centre of defence or on the right being a real asset. Although in his early years at the club he was not the most technically proficient, he had a will to win that endeared him to the fans. When playing at right back Boyce had not been the most fleet footed or the best of distributors, but it was all to change when Roberto Martinez switched to 3-4-3 in November 2012. 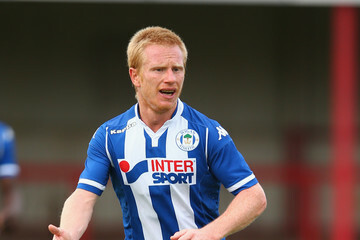 At the beginning Boyce looked uncomfortable in the right wing back position, but by the end of the season he had played his part in Wigan’s epic victories over the highs and mighties of the Premier League. Boyce had become the archetypal wing back, constantly available to receive the ball, helping stretch the play wide, thoughtful in his distribution and solid in defence. Wing back is a specialist position, not easy to adapt to for someone used to playing right back in a quartet. Martinez and the coaches had worked with Boyce and he had mastered the position with aplomb. In January 2015 Martinez had brought in Jean Beausejour to play the left wing back role in which he had been utilized by his national team, Chile. The two smooth functioning wing backs were key cogs in Martinez’s machine. Since Boyce’s departure no one has been able to claim the right back/wing back position as their own. In the first half of last season we saw glimpses of Kevin McNaughton, Jonjoe Kenny and Donald Love, with Tim Chow sometimes filling in. Donervon Daniels also played there when not playing in the centre of defence. Reece Wabara was signed in January and made 20 appearances without being totally convincing. He left in the summer after he and the club were unable to agree terms. The turnover has continued this season. So far we have seen Luke Burke, Reece Burke, Nathan Byrne, Alex Gilbey, David Perkins, Max Power and Yanic Wildschut play there. Loanee Kyle Knoyle has not yet appeared after getting injured in the pre-season. Were those who thought Boyce would be hard to replace right? Could Boyce have played a major role last season if he had stayed? In fact Boyce went to Blackpool where he made just 17 starts last season. The reality was that he was 35 years old when he went there, with his best years behind him. Moreover after Martinez’s departure the player had, more often than not, found himself being played more as an orthodox right back or central defender. His halcyon days as a Premier League wing back were over. Like Martinez, Gary Caldwell is a major proponent of the back three/wing back type of formation. But since taking over as manager he has rarely had the luxury of seeing two wing backs make a major impact in the same game. Moreover some of the players who have occupied the positions have not looked entirely comfortable with their roles. Caldwell’s main preferred formations can be described as variations on 3-5-2 and 4-3-3. To be able to switch between the systems he would ideally have players with a bank of prior experience playing as both wing back and full back. But with most of his signings coming from English clubs it was going to be more likely he would get players used to playing as orthodox full backs, having to coach them into playing the differing wing back role. Near the end of the transfer window Caldwell tried to sign attacking right full back Callum Paterson from Hearts, with an expectation of him playing either role. However, the deal never materialized and instead Caldwell signed Nathan Byrne from Wolves. The complication is that Byrne is essentially a wing back or winger. So Caldwell faces the choice of sometimes playing Byrne as an orthodox right back or bringing in someone else for the position when he wants his team to play with four at the back. When fit, Knoyle could challenge for a place, although he probably lacks the experience to make the position his own. Reece Burke is expected to return from injury shortly and can play right back, although he is primarily a central defender. The 18 year old Luke Burke knows both the wing back and full back roles through his time in the development squad, but Caldwell seems reluctant to rely on him as a regular alternative. When fit again Donervon Daniels will also challenge for a place on the right of defence. It is possible that Caldwell will seek an experienced right back/wing back in the January transfer window. But budgetary constraints might well preclude that option. Many fans prefer to see Latics play with an orthodox back four, citing greater defensive stability. However, in the latter days of the Martinez era at Wigan it could be argued that playing with three central defenders and two wing backs provided more defensive solidity than we had seen with a back four. But it does not necessarily work like that under Caldwell’s system. Is it that Caldwell just has not yet found the quality of wing backs he needs? Or is it that he sees them in a more attacking role than Martinez did? The right side of defence has been one of Caldwell’s biggest headaches so far in his brief managerial career. At this stage it looks like Byrne will be his first choice right wing back, when fully fit. But who would be his preference at right back remains to be seen. I am pretty sure you are referring to Luke Burke, Roshan. Indeed it is hard to understand, although the player has reportedly had some injury issues. Yes I meant Luke Burke. I know he’s had some injuries but he needs tobe given a chance.